Intern is Dr. Sandeep Jauhar's story of his days and nights in residency at a busy hospital in New York City, a trial that led him to question his every assumption about medical care today. Residency—and especially its first year, the internship—is legendary for its brutality, and Jauhar's experience was even more harrowing than most. He switched from physics to medicine in order to follow a more humane calling—only to find that his new profession often had little regard for patients' concerns. He struggled to find a place among squadrons of cocky residents and doctors. He challenged the practices of the internship in The New York Times, attracting the suspicions of the medical bureaucracy. Then, suddenly stricken, he became a patient himself—and came to see that today's high-tech, high-pressure medicine can be a humane science after all. Jauhar's beautifully written memoir explains the inner workings of modern medicine with rare candor and insight. 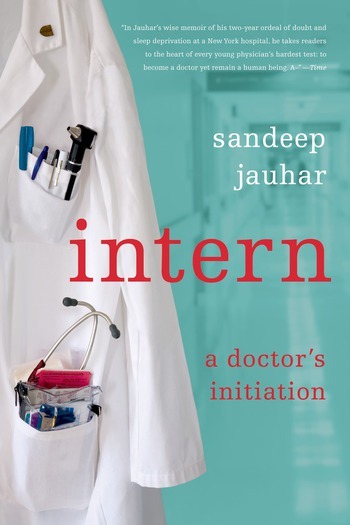 Listen to this audiobook excerpt from Sandeep Jauhar's book Intern: A Doctor's Initiation. Intern is Jauhar's story of his days and nights in residency at a busy hospital in New York City, a trial that led him to question his every assumption about medical care today. Residency—and especially its first year, the internship—is legendary for its brutality, and Jauhar's experience was even more harrowing than most. Sandeep Jauhar, MD, PhD, is the director of the Heart Failure Program at Long Island Jewish Medical Center. He writes regularly for The New York Times and The New England Journal of Medicine. He lives with his wife and their son in New York City.